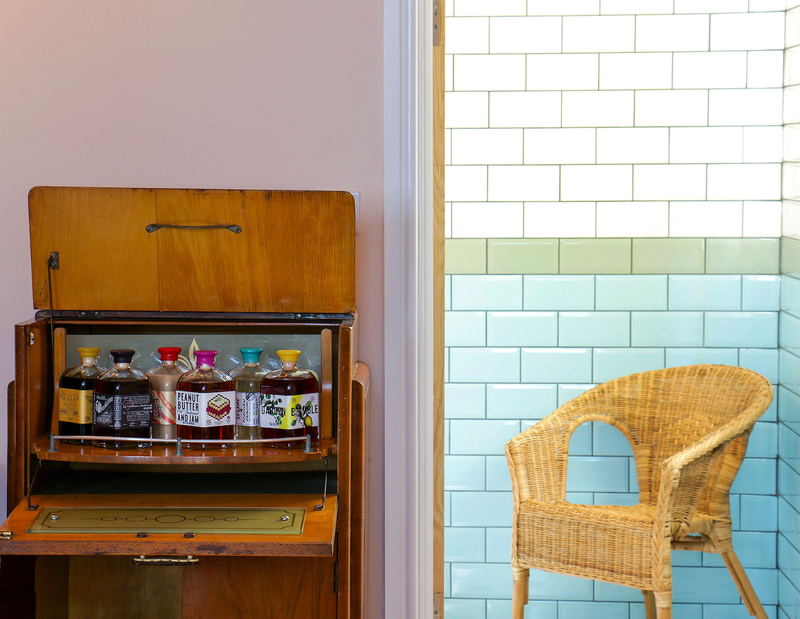 We at Sated love a new concept, but even we were somewhat baffled by the announcement that the storied pair behind Worship Street Whistling Shop and Black Rock had decided to open London’s smallest grand hotel, encompassing one guestroom and – wait for it – three bars. Our interest peaked, we decided to head on down to find out what the heck was going on. 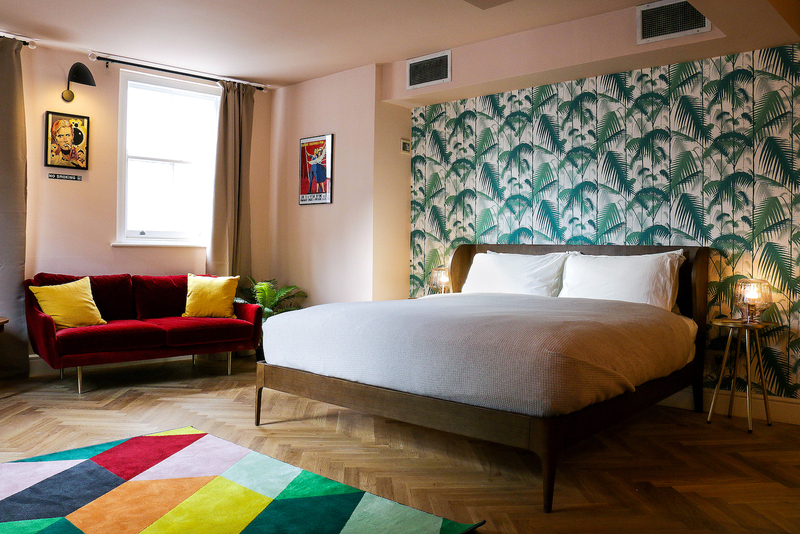 Located in that dubious zone between the City and Shoreditch sits the site of Thomas Aske and Tristan Stephenson’s latest project, aptly named The Napoleon Hotel & Bars. Quite literally builds on the success of their basement whisky bar, Black Rock, which opened in March 2016, the previous two-level Fish & Chips shop and top floor cocktail bar have been stripped back and converted to accommodate The Napoleon Hotel & Bars. As we tentatively open the unimposing front door, we are greeted by a smooth jazz soundtrack and floral carpeted stairs that bring smiles to our faces. Still not entirely sure we are in the right place, we wander on up one flight until come across a closed door with the signage “The Devil’s Darling.” Before we can decide whether to knock or just try the handle, the door swings open and the ever-charming Bar Manager, Romeo, welcomes us to the cocktail-bar-meets-check-in-desk. The concept behind the first bar is to celebrate classic cocktails. Nothing else is offered and nothing else is needed. Despite it only opening the previous month, The Devil’s Darling has the feel of a place that has always been there. Ornate, painted figures stare at you from the fresco behind the marble-topped bar, over which hangs a neon ‘Bar’ sign (in case you were in any doubt). Coral red curtains and retro-esque furnishings complete a slightly mismatched look that is perhaps a tongue-in-cheek play on the outdated hotel bar aesthetic that still pervades many of the surrounding establishments. The menu changes on a daily basis and consists of just three cocktails: a Straight Up, a Long, and a Short. Romeo explains that this is so that there is something for everyone but guests will have a reason to come back as the experience is always different. As we sit and peruse today’s offerings, a dainty saucer of prosecco, a glass of water and a selection of Queen olives and truffle nuts is placed before us – a complimentary part of the service that gives us time to settling in and sets the tone for the evening. 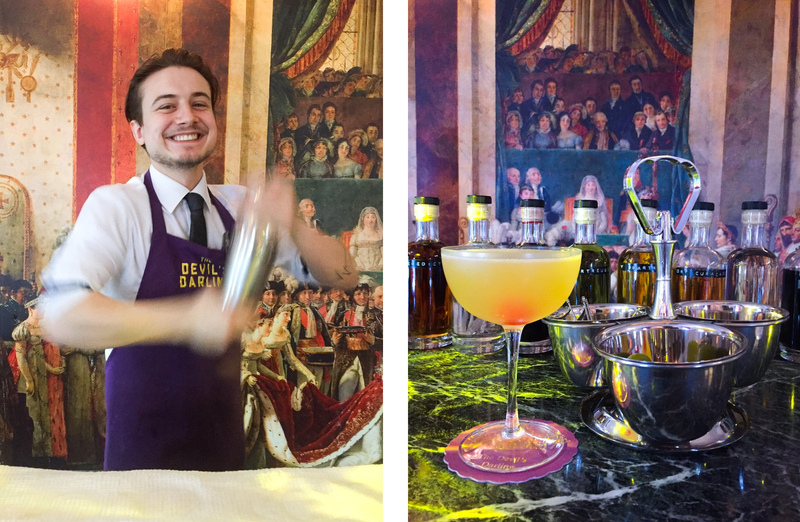 We sample two of the three drinks on offer – a strong yet incredibly balanced Pendennis Club, which blends cognac and gin together with apricot brandy and a squeeze of lime, and a Gold Rush with its classic combination of bourbon, lemon and honey. As we sip on our respective choices, Romeo talks us through their histories and assures us that if we don’t want what’s on today’s menu, he can make us whatever classic cocktail our hearts desire. 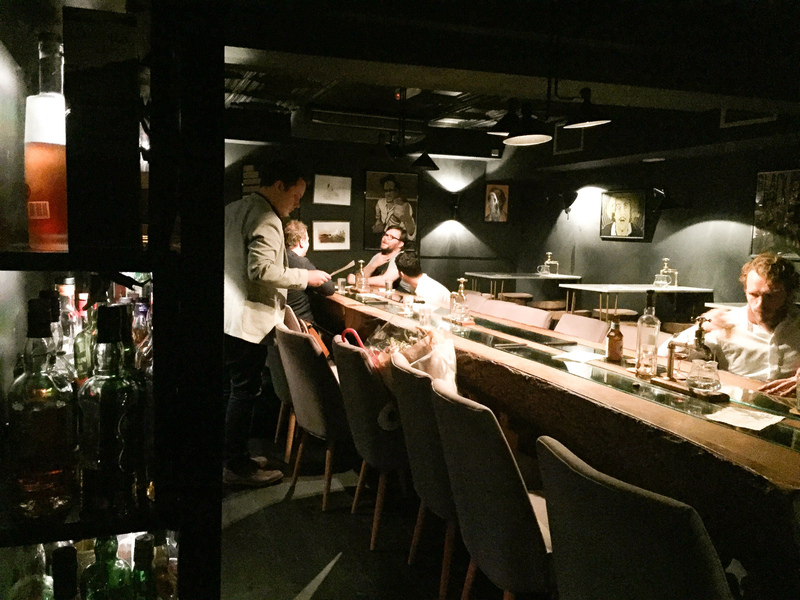 To say that the bar is quiet would be an understatement – it is empty, apart from us – but strangely, this does not detract from our enjoyment of it, or the general relaxed and friendly atmosphere created by the two bartenders. Whilst we’re told that the venue is getting busier and busier each week, it must be said that it’s quite nice to have a bar in central London to yourselves. An odd combination, to be sure, when most people associate sherry with their grandmothers, but it works! The atmosphere is lively and the small space is packed with young city workers looking for a place to unwind. It certainly helps that the prices have made their way over the pond along with the Sherries. A glass costs £4 or £5, and a bottle can be bought for around £40. This economy continues past the sherry menu with Estrella on tap for £3 and a bottle of sumptuous house wine to be had for £16. 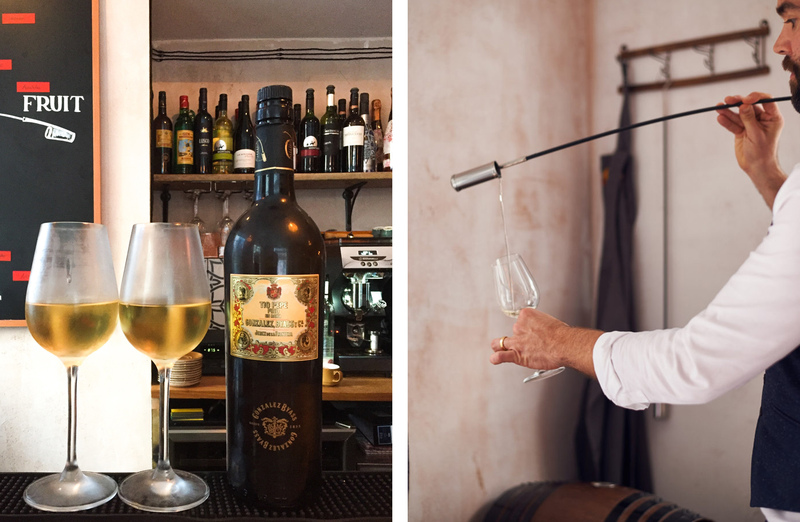 The staff are wonderfully knowledgeable and attentive, and the vivacious Marian was happy to encourage our somewhat uncultured palates in the ways of sherry. We took her up on her recommendation of the Tio Pepe Fino En Rama, which intrigued us with its complex aromas of toasted almonds, soda bread and bitter citrus. 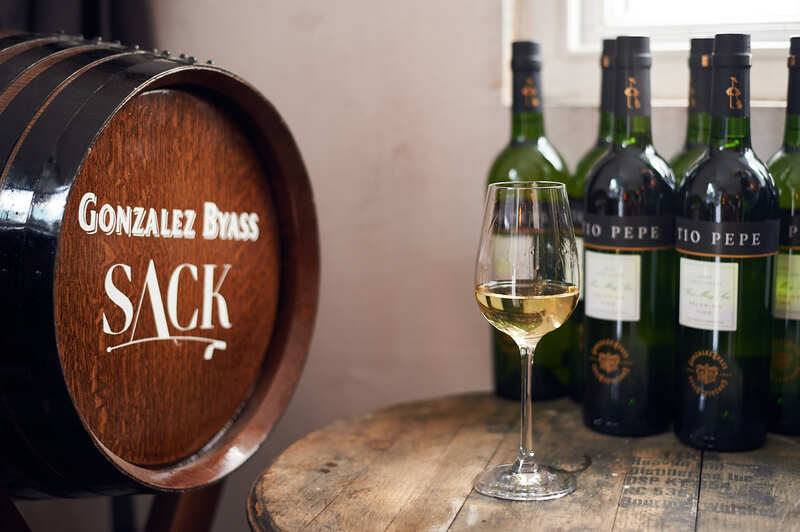 The taste was surprisingly dry and chalky – not what we expected of a sherry at all – and came perfectly chilled. 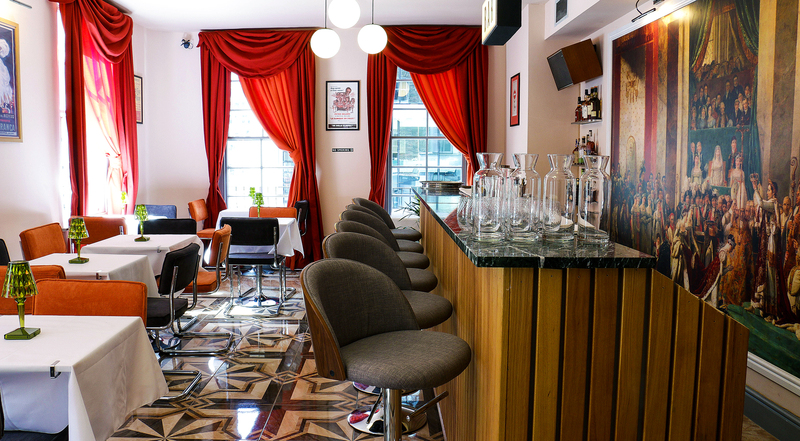 Sack is the ideal summer after-work hangout for those wanting a relaxed bar with a bit of a difference. The oldest and most well known amongst the offerings is the subterranean whisky den, Black Rock, which opened its doors in March 2016 with the incentive of creating a welcoming and accessible space for whisky lovers (and their unwitting friends) to call home, and we must say, it has succeeded. The basement is dominated by an imposing 185-year-old English oak tree trunk that has been turned into a table-come-barrel. 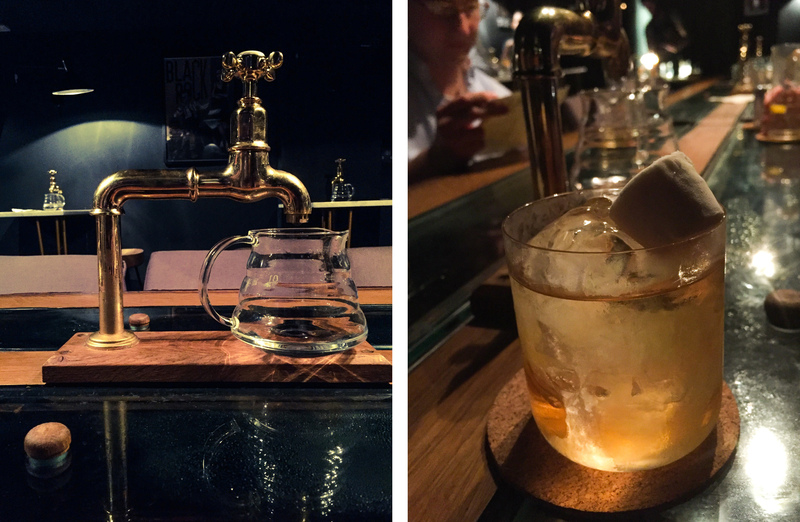 This genius creation has two trenches carved into it that house the bar’s own whisky concoctions that are maturing within the trunk and which can be siphoned off through mounted brass taps. One “barrel” contains an aged mint julep – a classic American cocktail combining bourbon, mint, sugar with Angostura bitters – which our host Alex describes as their “gateway drug to the world of whiskey for non-whiskey drinkers.” The other is their “table whisky” which, like a table wine, aims to be accessible, easy-drinking and well-priced. However, the characteristics of the rye-whisky-based cherry liqueur that once sat in that cask has started to assimilate into this current batch, making it not to everyone’s taste. The other striking thing about Black Rock is that there is no bar. Instead, one side of the venue is lined with glass cabinets housing over 250 whiskies arranged by flavour: smoke and fruit by the door, balance and fragrance in the middle, spice and sweet at the far end. Lighter bottles are on the top shelf and heavier-bodied ones sit on the bottom. This novel approach to a whisky list makes the entire experience hugely interactive and fun, and we enjoy wondering up and down the aisle, peeking in at the golden beauties and asking the staff about their properties. As well as the seemingly endless choices of drams, and the drinks embedded in the very table itself, there is a small cocktail menu that offers highballs and cocktails – all whisky-based of course. The options are many but the fantastic service and jovial, communal atmosphere mean the experience is far from overwhelming, and while you may need help climbing back up the stairs after a visit, you will definitely want to come back for more. Once we have dutifully samples a tipple or two from the hotel’s bars, we (slowly) make our way up the stairs to our room. Modern furnishings and in-room technology are set against throwback wallpaper and a home-y feel. The large bed is the centrepiece, facing a TV that has been preloaded with Amazon Video and Netflix. The blue and cream metro-tiled bathroom includes a large freestanding bathtub with an overhead shower and a light yellow shower curtain that seems purposefully disjointed with the rest of the décor. Vintage-style floor tiling continues the sense that you’ve walked in on an inside joke that you are not yet privy to. Designing a new guestroom to purposefully feel dated is certainly a brave and original concept. If we had just heard about it, the sceptic in us would have rolled our eyes and expounded that this was a ridiculous offshoot of Hipster-dom similar in premise to shops that make new “vintage” clothes. However, we would’ve been very wrong. There is something in The Napoleon Hotel & Bars’ décor, service and charm that make it feel genuine. It is truly a concept hotel where you don’t just get a room but become part of the venue for the duration of your stay and are therefore given an experience that it will be hard to forget anytime soon. You can book a room at London’s smallest grand hotel here.